Jennifer Angus installing A Case of Interruption and Disruption at 516 ARTS. Photo courtesy of 516 ARTS. 516 ARTS blogger Josie Lopez is the curator at 516 ARTS. 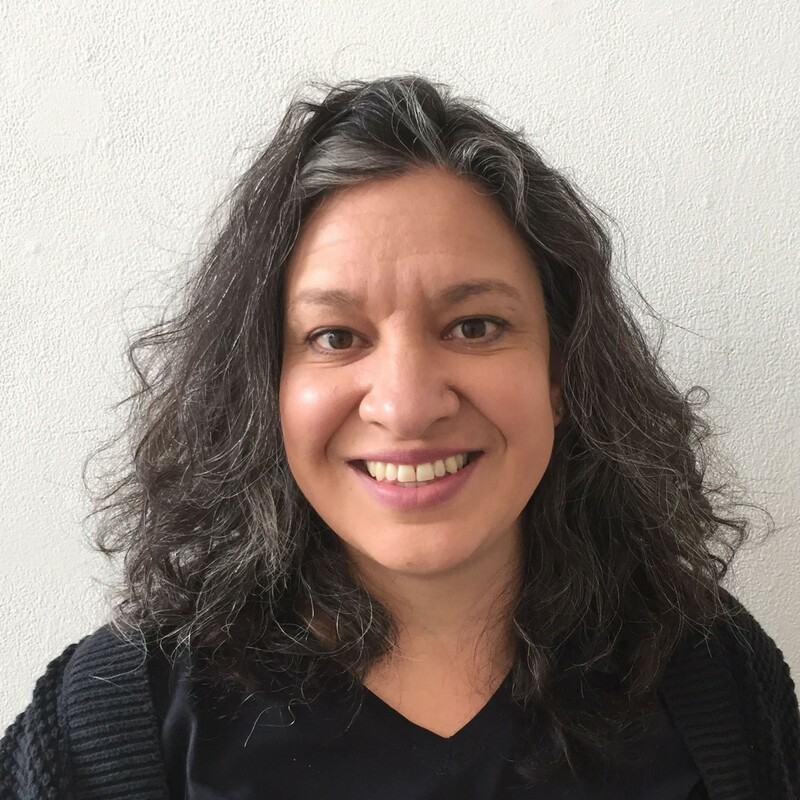 Her research interests include examining contemporary art as a discursive agent in the political arena, modern and contemporary Latin American art, 19th century France and Mexico, and the history of New Mexican art. She has a Ph.D from the University of California, Berkeley. 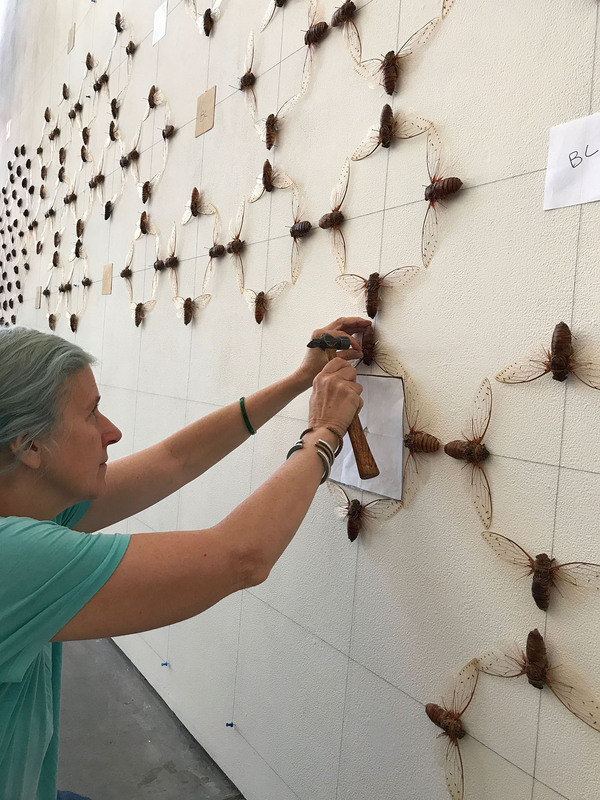 Jennifer Angus is hard at work creating her newest installation at 516 ARTS for the exhibit Cross Pollination, opening Saturday, August 19, 6-8pm in downtown Albuquerque. 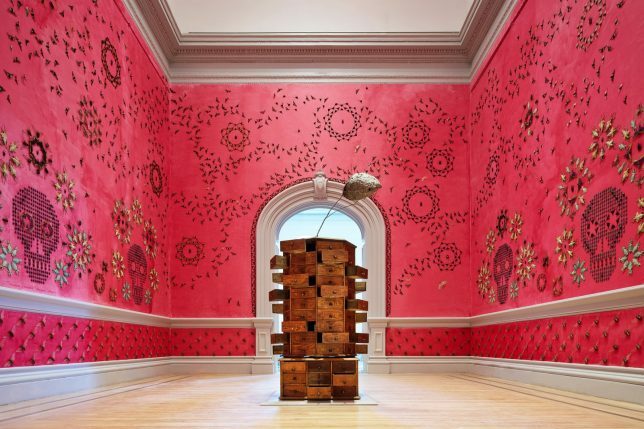 Angus’ In the Midnight Garden was exhibited at the Smithsonian’s Renwick Gallery re-opening show, Wonder, in 2015. Her new installation for Cross Pollination entitled A Case of Interruption and Disruption is made up entirely of insects. 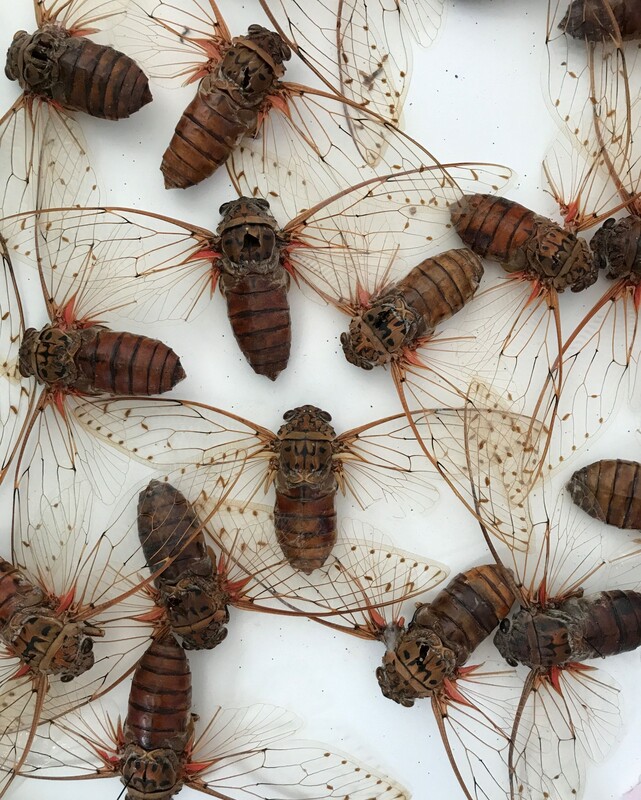 Angus collected thousands of bugs from Southeast Asia and other parts of the world, and carefully arranges them to create and fracture patterns that are intended to change how insects are perceived. Displayed in their natural state, these winged and walking species are ordered in arrays that echo domestic designs like wallpaper as well as patterns of the natural world including hives and webs. Other insects break from the structure into swarms, mimicking the chaos of nature. Angus’ work is informed by Victorian design and traditions of collecting. Also on view is her Cabinet of Curiosities in which drawers are filled with a whole cast of insect characters acting out different stories. These anthropomorphized bug tales transform the ways in which the human world views the insect world. Both Jessica Rath (A Journey for the Senses Part I) and Angus have been shaped by direct interactions with nature and science, a desire to understand insects more deeply and a desire to advance the discourses around current dangers facing the natural world. Rath discussed her works with 516 ARTS’ curator Josie Lopez last week; this week Angus shares her process. Josie Lopez: How does your unique media—actual bugs—impact your work and audience responses to it? Jennifer Angus: When viewers enter one of my installations, they are greeted with something they initially think they know, that is, a patterned wallpaper. However upon closer examination, one discovers that it is entirely made up of insects. Emotions range and rapidly fluctuate from fear to awe to distaste to wonder. The attention to intricate detail as well as the sheer number of insects comprising the work is often overwhelming. A tension is created by the beauty one observes in the pattern and the apprehension we feel toward insects. In fact, we have a certain hysteria about them. Culturally, insects are a sign of dirtiness and disease. My work explores ideas of home and comfort. It alludes to the unseen world of dust mites, germs and bacteria, both friendly and not. It also takes inspiration from the Victorian era, for it was a time of great collecting. For the insatiable Victorian collector, nothing was sacrosanct. That said, rest assured that while I may allude to threatened species, none of the insects I use are endangered. Your Cabinet of Curiosities houses a whole host of characters acting out various tales. How do stories inform your visual art in general? Perhaps you have walked on a warm summer evening and seen fireflies dancing in the sky. There is something magical about the sight, and one wishes one could be part of the festivities and the mystery. Such a desire may seem childish, and I note that indeed children’s literature is populated with wonderful six-legged characters such as the insect companions in James and the Giant Peach or the fabulously glamorous cockroach in La Cuchuracha Martina. In fact, what is considered the first children’s story in the English language which was not a moral tale or fable is The Butterflies Ball and The Grasshoppers Feast by William Roscoe, dating from 1808. In the Victorian era, both adults and children were introduced to the natural world through a large number of educational publications in which insects were anthropomorphized so as to have greater appeal to the general reading public. I have often made a connection between my work and children’s literature because curiosity, imagination and magic are key ingredients. As children become adolescents and then adults, insects become repellent. Adults are often jaded. Rarely do we feel amazed in this busy world, but I do hope that those who take the time to visit one of my installations will simply walk in, say “Wow!” and for a moment experience that wonder they felt as a child. Jennifer Angus, In the Midnight Garden, Renwick Gallery, 2015. Photo courtesy of 516 ARTS. How do pattern and the disruption of pattern define your work and how has this approach connected your work with science? Generally speaking most people like pattern in large part because it is predictable; we know what is going to come next. When a pattern is disrupted it is jarring and upsetting. I have observed that many people dislike insects but when formed into patterns, a kind of ordered control is established. It puts people at ease. Isn’t that what man has always sought to do? We want to control Mother Nature. When I disrupt the patterns and in particular create swarms, I’ve found that people dislike the chaos because it appears to mimic the insects’ true behavior. It is wild and uncontrollable. The connection I have made between insects and pattern is not arbitrary. Scientists have identified 950,000 insect species, and the beetle (Coleoptera) population alone makes up one quarter of the animal population. Presumably there are other species which have yet to be identified or to evolve, thus one could believe that discovery might continue to perpetuity. We need insects to survive. They pollinate flowers which in turn produce fruit. Seventy percent of the food we consume is the result of insect pollination. The world is starting to wake up to the devastating tragedy that awaits us all if colony collapse—the death of millions and millions of honeybees—goes on unabated. The role of insects in decomposing matter is not to be underestimated either. Our world would become a massive trash heap without insects, and the human race would no longer exist. Ultimately, I feel that while my work is an art installation, many people who have never darkened the door of an art museum will come to see big insects. This gives me the platform to start a discussion on the importance of insects to our environment and the planet as a whole. Malaysian cicadas. Photo courtesy of 516 ARTS. How has your work been informed by your experiences with cultures and geographies different from your own? People often ask me how I first started working with insects. The answer is that I spent several years in the late ’80s and early ’90s in the area known as the Golden Triangle (where the borders of Thailand, Laos and Myanmar, formerly Burma, meet) researching tribal dress. At that time, I discovered a particular garment known as a “singing shawl,” worn by young women of the Karen tribe that is embellished with metallic beetle wings in place of beads or sequins. It was very exciting to find something utilized that was so naturally beautiful and readily available. Since then I have found other groups that use whole beetles or the wings applied to garments, headdresses and baskets. In 1995 I finally got my hands on some of the metallic beetles that I intended to use in a piece. I was doing a residency in Japan, just outside of Tokyo. Part of the purpose of the residency was to interact with the locals and any visitors who came to my studio. There were three little boys eight or nine years old—Yoshi, Daiske and Nori—who came to visit every day after school. One day they saw me working with the insects and they thought, “Cool! She likes insects, we like insects!” and a friendship was formed, although we had no language in common. It is not unusual for Japanese children to keep insects as pets. Each day the boys would stop by and show me what they had caught. If it was dead they generally left it with me, and if alive they took it home to put in little cricket cages. After a while my studio was beginning to look like a bug cemetery, and so to amuse the children I started dressing up the corpses in costumes. I started with large rhino beetles. I was able to dress them in paper kimonos and mount them on a board so that they appeared to be standing. I had the rhino beetles modeling spring and autumn kimono fashions, dung beetles as sumo wrestlers, and so on. How does your work raise awareness of human impacts on pollinators? Particularly in the sense of degradation of habitat. There is often confusion as to whether the insects in my work are real. Yes, they are, although they are dead and dried. The colors are their natural color. I have not painted them. I have spent considerable time in Southeast Asia, particularly Thailand and Malaysia where most of the insects I work with come from. While none of these species are endangered, it is important to note that their habitat is under assault. Unsurprisingly, forests play second fiddle to human demands for agriculture and urbanization. Intellectually we recognize that forests are the lungs of the planet but not enough is being done to protect this precious resource. Virtually every insect on the endangered species list is there because of loss of habitat. Many people who visit my exhibitions were never aware that such unusual insects exist. I hope that my exhibition will get them excited and perhaps they will be motivated to get involved with one of the many rain forest preservation projects out there. I would also like people to think about their own environment and behavior. How is urban and suburban encroachment affecting wildlife big and small in your neighborhood? It is easy to take up the case of larger mammals, birds and fish, but what about smaller creatures who have an important role in the ecosystem to play, be it pollinating flowers or helping in the decomposition of various matter? You can join Jennifer Angus this Thursday from 5-7pm at 516 ARTS for an Open Studio and Q&A event, and for the public forum Cross Pollination: Art + Science this Saturday at 3:30pm. Cross Pollination opens August 19 and runs through November 11, 2017 at 516 ARTS, located at 516 Central Avenue SW in Downtown Albuquerque. Curator Valerie Roybal brings together artists from all over the world who explore the intersections of art, science and the importance of pollinators. For 516’s public program through the fall, see the 516 ARTS Program Guide.